As we approached the Santa Barbara Bed and Breakfast for the first time, we could smell the freshly baked chocolate chip cookies before we even opened the front door. Those alluring aromas were more welcoming than any boutique hotel’s front desk could ever be. The Bath Street Inn provides guests with more than just Bed and Breakfast. Its location in a cottage-filled neighborhood a mere three blocks from State Street means much of the area’s restaurants, shops and downtown sites are within easy walking distance. If the 20 blocks to Stearns Wharf and the beach are further than visitors want to perambulate (especially with a belly filled with homemade chocolate chip cookies), there is a convenient trolley that stops nearby and costs a quarter. There’s also a parking lot and plenty of street parking for cars if you want to drive off to nearby wine country. The dozen rooms vary, as they do at most B&Bs, so ask what’s available during your scheduled stay and consult the website to make the most of your visit. In the front Victorian house, which dates to the 1890s and sports a rare eyelid balcony, the Tiffany Room features a clawfoot tub in the wooden-floored bathroom. 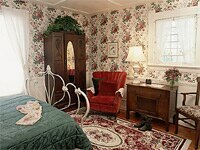 The Rose Room, perhaps the most romantic selection, offers a rose-patterned rug and wallpaper, an iron bedstead and doilies aplenty. All eight rooms in the front house feature private bathrooms, Wi-Fi and cable TV, and some rooms on the top floor have unique angles and dormer windows. We stayed in the Country Suite, in what’s known as the Summer House, a separate building in the back which was built during the 1990s. The second-story suite has a four-poster queen canopy pencil bed, plus a rollaway bed, a full kitchen with microwave and coffeemaker, gas-powered Franklin stove, a pair of rocking chairs, cable TV, VCR and a whirlpool tub. The two buildings are separated by an outdoor courtyard, where guests can enjoy the staff’s culinary prowess. Breakfasts consist of such delicacies as homemade granola, poached pears and peach-stuffed French toast, served with cloth napkins and plenty of hot coffee refills. 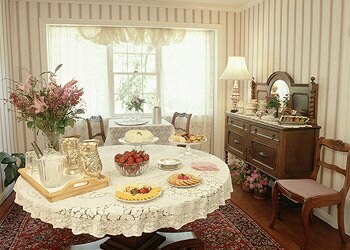 During the afternoon, homemade cookies and cakes are served along with lemonade and tea. And in the early evening, wine and cheese are put out, followed by decaf coffee. These, along with breakfast, can be enjoyed in front of a fireplace in the Victorian parlor, which also has a video tape library and games. If one member of a party wants a little quiet time, the other can retire to an upstairs common room to enjoy a video or a view of the neighboring mountains. 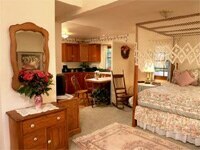 The owners are often on site, but there is a resident innkeeper couple there 24 hours in case problems arise. The service is friendly and efficient. Don’t expect top-quality spa products; our bathroom had Alberto VO5 shampoo and conditioner. But you can always buy good shampoo at home. Tasty homemade chocolate chip cookies fresh from the oven are a little tougher to come by.